Inspired by Czech crystal, our new SUV is the epitome of refinement. But don’t be fooled, the KAROQ also has an appreciation for the great outdoors. The sideshow that steals the show. With angular wheel arches and protective sill covers, there’s no mistaking the KAROQ for anything but an SUV. Prepare for some backwards glances. Cat's eye reflectors in the bumper and the iconic wedged- shaped rear lights work to help illuminate KAROQ’s lines. 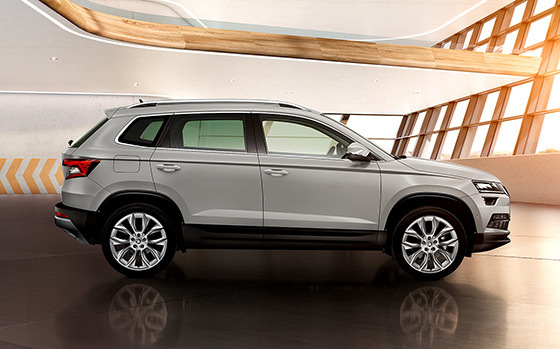 One look at the distinctive ŠKODA grille and you know this SUV means business. Its fog lamps and sharply cut headlamps help light the way when you’re off-roading. The KAROQ’s interior was designed around one thing and one thing only – you. The love child of smarts and style, it’s packed with intuitive tech. The interior has everything you need – and it’s all right in front of you. 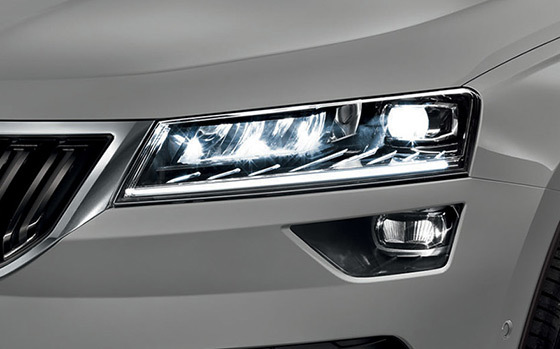 Every aspect of the KAROQ has been thoughtfully designed, including the exterior lights. The Premium Package comes with a complete LED system, which you could say is a very bright idea. 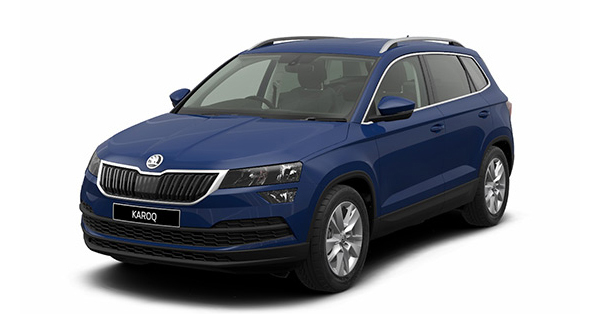 Standard with the KAROQ, LEDs located on the underside of the front doors create the ŠKODA logo, illuminating the entry area. are available for the KAROQ. The LED headlamps (included in the optional premium pack) offer high-performance and high energy efficiency. The AFS (Adaptive Frontlight System) adjusts the lighting intensity to specific conditions (e.g. city, motorway or driving in the rain), while the main headlamps boast an eye-catching integrated strip of LED daytime running lights. Under poor light conditions the LED fog lamps come into their own, to make you safer. Inside you’ll find a place for everything – phones, glasses, drinks, snacks. Were there any reason at all to do so, you could even bring the kitchen sink. Now this is virtually magic, swipe your foot underneath the boot and, hey presto, it opens or closes automatically. It opens and closes at the touch a button. There is a button on the remote control and in the driver's door, especially handy in nasty weather. ΔAvailable with optional Tech Pack. 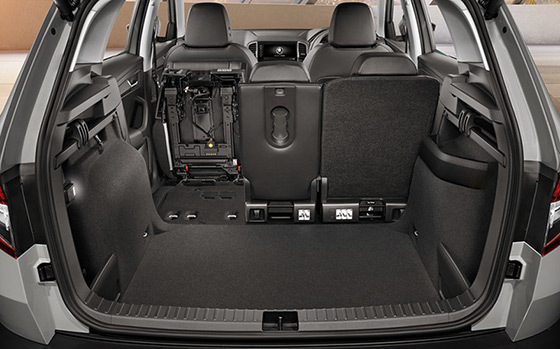 The VarioFlex rear seating system is comprised of the three back seats. Each one can be folded down or removed completely independently, giving you plenty of flexibility. With all three folded down you get a luggage capacity of 1,605 litres. 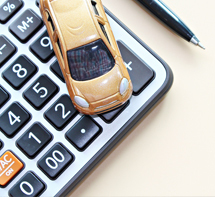 Take them out and you’ll have a whopping 1,810 litres, that’ll fit around 67 yoga mats (we think). 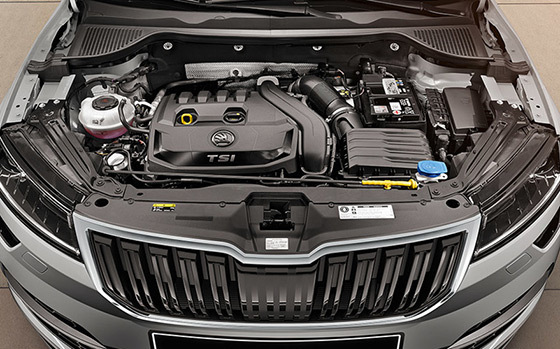 The turbo engine offers a triple threat of modern, dynamic and economical. Win. Win. And, you guessed it, win. The 4-cylinder 110 kW engine comes with ACT (Active Cylinder management Technology). This system disconnects 2 cylinders when not needed, considerably reducing fuel consumption. The KAROQ can be equipped with manual 6-speed transmission as well as automatic 7-speed DSG (Direct Shift Gearbox). 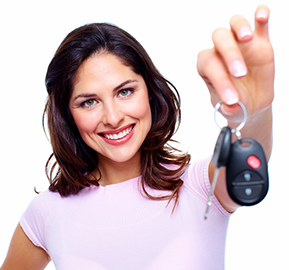 Minimise the hassle of parking in tight spots with Park Assist. At the press of a button, the system will begin searching for a parking spot in a row of parallel or perpendicularly parked vehicles. The car will steer itself into the space while the driver controls the pedals. Your safety is our number one priority. In extreme situations, when the driver cannot actively influence the like the airbags. 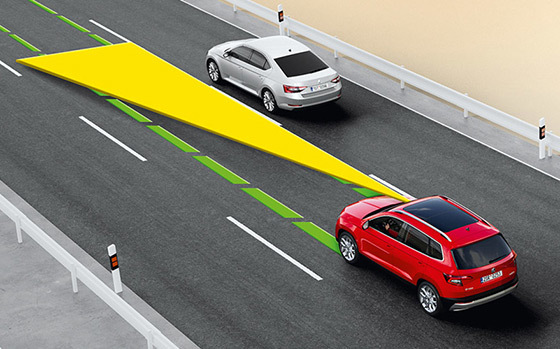 ◊ Safety technologies are not a substitute for the driver's responsibility for the vehicle. †Available with optional Travel Pack. 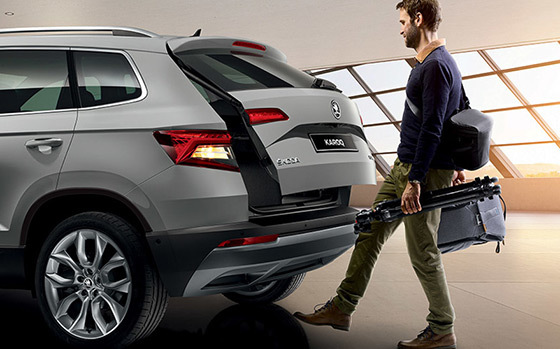 KAROQ is packed with the technology options that can make everyday journeys easier and more enjoyable. 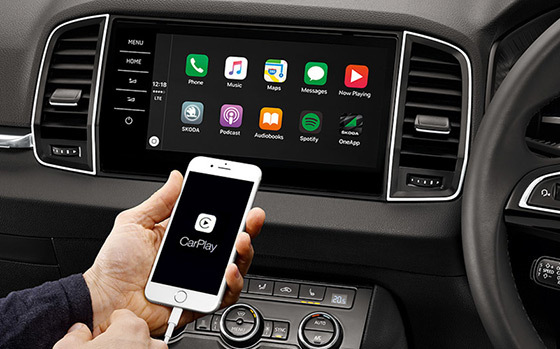 Smarts inside mean that it can seamlessly sync with your external devices. Better still, your kids will never get bored on a journey.